On the WordPress Dashboard, click the Customize link on the Appearance menu. The Customizer panel opens on the left side of your screen. The Customizing Colors screen opens. Select the Dark option to change your color scheme to a prebuilt dark palette. Select the Custom option to configure your own color. Selecting this option displays a color-palette bar. On the color bar, select your preferred color. Click anywhere on the color bar to set your preferred background color. Click the Select Color button in the Header Text Color section to change the color of the text that appears in your header. The Select Color button changes to Current Color after you click it to set the color value. You can click anywhere on the color palette that appears or type a six-digit hexadecimal code (hex code, for short) if you know your preferred color. When you finalize your selections, click the Save & Publish button. The Twenty Seventeen theme’s color options. 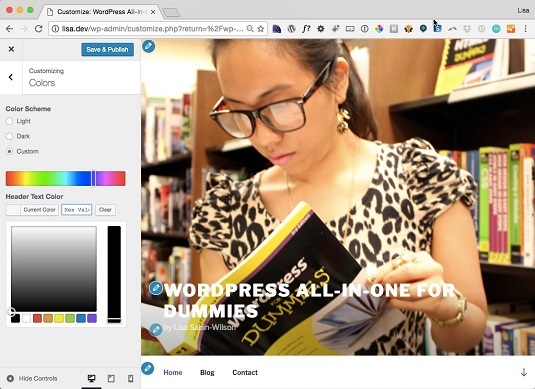 The WordPress Customizer displays on the left side of your computer screen while a preview of your site displays on the right side. As you’re making changes in the Customizer, you see a preview of what changes those options make on your site so you can preview before you publish.